Here is a full list of cleaning services we do, some information on them and a referral to their main page. All of these cleaning services can be combined in one order making you eligible for a multiple service discount. Carpet cleaning in Liverpool – offers clients a comprehensive treatment for all carpet types, successfully rejuvenating even the most disheveled ones. By using dry or steam treatments, we can remove stains of all origins. For more info go here. 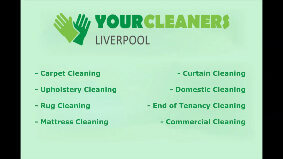 Curtain cleaning in Liverpool – allows clients to remove smells, slight discolorations, stains, dust and dirt accumulations from your curtains. We use a wide spectrum of detergents that allows us to more precisely clean your drapes, damage free. Read more about how we clean here. Rug cleaning – this treatment is suitable for the cleaning of regular and exotic rugs alike, with the usage of natural detergents and methods with minimal consequences for the rug's colours and strength of the fibers of your rugs. Inform yourself here. Liverpool upholstery cleaning - for the deep and cosmetic cleaning of the upholstery of all types, with ranging expertise from leather to sued and a lot more. We will remove stains, blemishes, odours from your furniture and this will prevent damage in some instances. Learn how we manage to do that here. Liverpool mattress cleaning – get rid of bed pests that are ruining your sleep or simply disinfect the mattress. The mattress cleaner uses natural methods and detergents with proven success, without having to rely on heavy, potentially harmful substances in your sleeping quarters. For more information on the methods, check here. Domestic cleaning – gives our clients the freedom of a fully customisable service, which allows them to choose which part of the house to be cleaned from domestic cleaner, how and for how long. Learn more here. Commercial cleaning in Liverpool– this is a service optimized for the cleaning needs of business, corporate and commercial clients with all of the appropriate methods to easy the entire process. We cater to your needs fully, with personal account managers, private, on-site quotes and estimations and constant customer support. Book or learn more here. End of tenancy cleaning service – EOT service is performed by fully trained cleaners. For more details go here. After builders cleaning service – this service deals with removing filth and cleaning up after construction work. This includes the removal of from floors, windows and any other surface is should not be on as well as fine dust and any other contaminant. Window cleaning – we work on the outside of the windows, removing saturated dirt and grime from the glass and frame of the windows, using only purified water that allows us to better dissolve the dirt without hurting the plastic of the windows. Oven cleaning in Liverpool – get rid of greasy leftovers, food staining and any other cooking related filth in your oven. We can make it shine almost like new, without the usage of dangerous chemicals, relying on skill and natural detergents with high biodegradability.